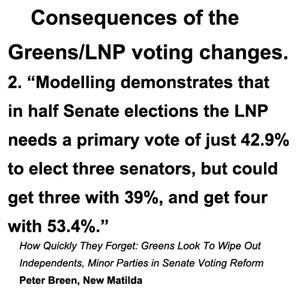 Did the Greens Make the Senate More Democratic? 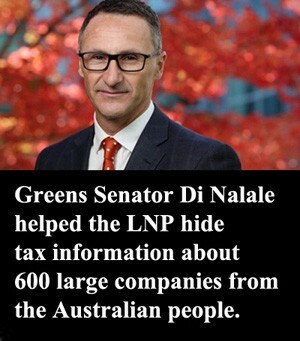 After Senator Di Natale became the leader of the Greens, people who pay close attention to events in our Parliament began to notice a new phenomenon. In the past, under Christine Milne, the Greens were reluctant to make “deals” with the LNP. Suddenly the Greens broke from the Labor-Greens-Independents' opposition to LNP legislation. One of their last “deals” before the current election was to change the voting system for the Senate. The change to the previous Senate voting removes the use of Group Voting Tickets. To the Greens, this system “gives political parties power over the preference choices of ordinary people who vote Above the Line.” On their view this allows “backroom party deals” to determine preferences. 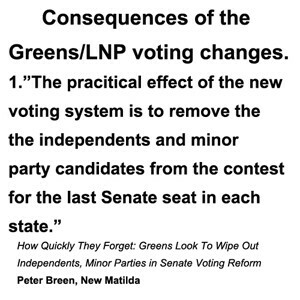 The Greens Party sees these changes as “the most democratic way to fix the Senate voting system.”(GV) The change is seen as removing the power of political parties to determine preferences, and allows everyone to choose preferences themselves. We should realize that it was only the Greens and the LNP who thought there was anything wrong with the system in the first place. As more and more people have become disappointed with the major parties, voters have given more and more support to a range of minor parties and independents. In fact the Greens themselves got a foothold in politics thanks to this system. The LNP thought these Senators made the Senate “unworkable”, meaning that they did not blindly approve all LNP legislation. Many people consider the relatively independent Senate as a way to keep the party controlling the lower house honest. And indeed, this has always been the justification for a democratic system with two “houses” elected in different ways. HOW CAN WE DETERMINE WHAT IS MORE OR LESS DEMOCRATIC? 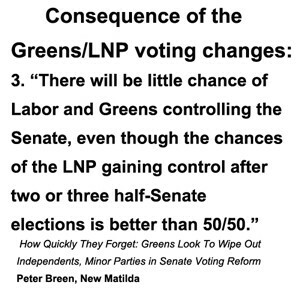 According to the Greens, their Senate changes make it “more democratic”. The problem is that such a justification relies on what you think an “ideal” democracy might look like. How else can you say one system is more or less democratic than another? Judging the “reform” as better or worse when compared to some ideal democratic system is a real can of worms. Instead I will begin to look at this “reform” from another perspective. What are the real-world consequences of this change for the Australian political system today? 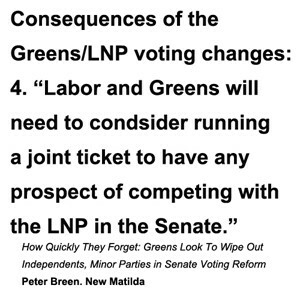 In other words, under the new system the LNP will very likely control the Senate in their own right, and the only hope for either Labor or the Greens is to work as closely together as the two parties in the LNP do. 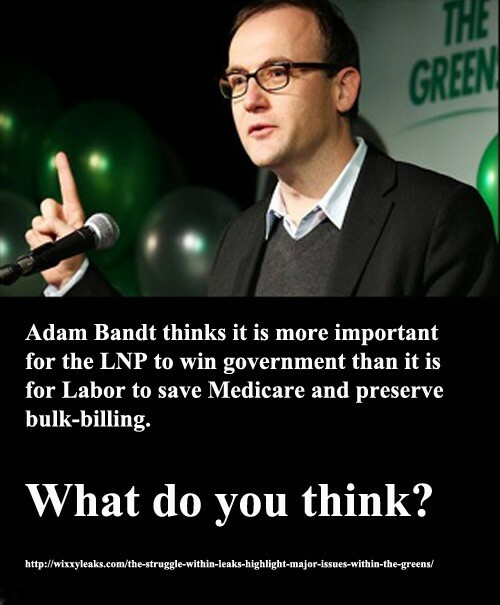 Do you think this how Senator Di Natale sees the future for the Greens? On the evidence, I think he has no intention of such a coalition. 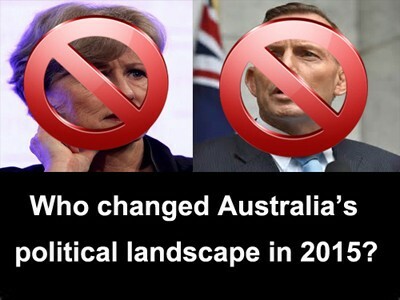 Who Changed Australia's Political Landscape in 2015?